I have 5 computers all behind a NAT enabled router and one server with a Canon PIXMA IP3000 attached. I think it is a great printers since it can print duplex and compatible ink cartridges can be bought for about 4$ (25 DKK). The server is running Debian Etch 4.0r0 and a CUPS (Common UNIX Printing System) server which all the five computers uses to print. This way I can print from Macintosh OS X, Windows XP and Linux with out any hassle. My server is actually an old laptop which I have installed Debian Linux on. The installation is beyond the scope of this article but I can recommend the article The Perfect Setup – Debian Etch (Debian 4.0) (howtoforge.com). CUPS running on my server with the printer installed with to different drivers. One for duplex and one for simplex. # Show general information in error_log. 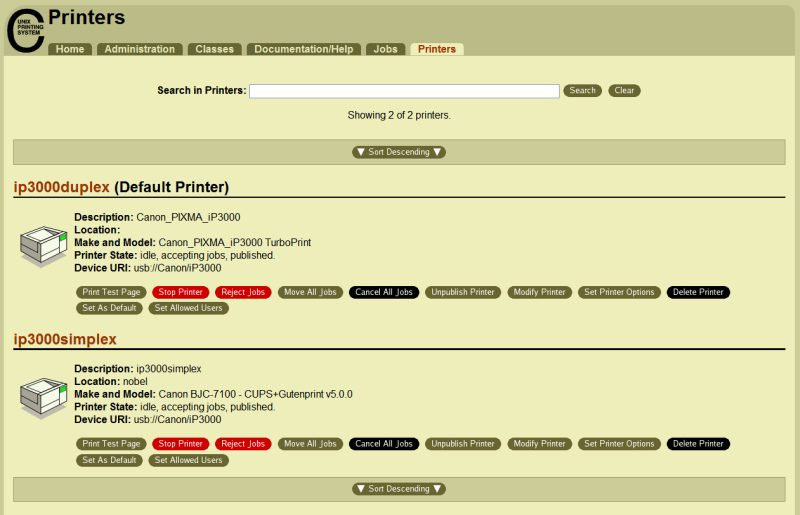 Now I can use the turboprints setup tool to add the new printer which I call ip3000duplex. The config for this new printer can be changed with the tool tpconfig. The most important change is to set the quality to draft – if not there will be a turborpint logo on every page. I use this driver to provide duplex printing of articles I read and later throw out, so quality is not important. OS X is nice from my perspective since it much closer to Linux and easier to manage. OS X even comes with CUPS installed, so instead of using the build in graphical tools, which is somewhat limited since it can add raw printers, I can add the printers through the Macintosh own CUPS server. The graphical tool is actually just a fronted to the cups server. This is done by pointing a browser to the address http://127.0.0.1:631. 127.0.0.1 is always the IP address of the local machine and 631 is port number of the cups server. The next step is to define a driver and here the right choice is “RAW”. The driver I chose was Generic and the MS “Publisher Imagesetter”. I like the booklet printing feature of my IP4000R… Is this supported by this CUPS setup? It worked very good!, now my problem is that i can not print from some applications on the mac. Can you give me some hints if you know? Allan Ploug: I guess that would depend on the driver used on CUPS server. If the drivers support the feature you just make a “new printer” on the cups server with those settings and then it should work. I am not sure if the feature is present though. I finally find the solution… i have to add my server in my mac, the problem was that my mac was looking for a machine named presario, i add it inside the “netinfo manager” and everything works very good. The server and my mac speak the same language: unix+cups. Now i can print remotely to a laptop-debian-server in a PSC1215.